Produced by Itzik Yona and Avital Raz. Sad Songs About the End of Love started out one late summer night in Jerusalem, after Avital Raz’s marriage plans were abruptly cancelled. The first Joyce poem she tackled was number 28, which starts with the line “Gentle lady do not sing Sad songs about the end of love….” Being a rebellious one, she did. 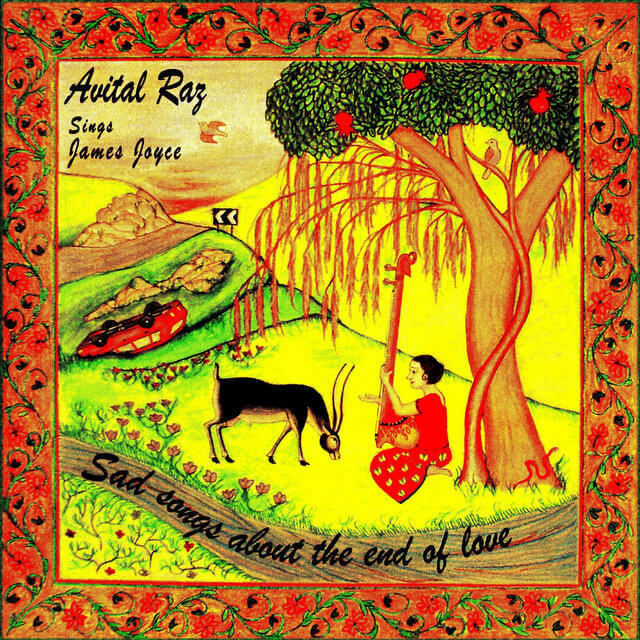 This album was recorded twelve years ago in Varanasi (Benares) and Delhi, and later in Israel. However, when Avital sent her newly recorded album to the Joyce estate, in the person of his grandson Stephen Joyce, she received back a letter saying that the connection between Joyce’s poems and Indian instruments and raags was ‘inappropriate’ and that her use of the poems, still under copyright, was forbidden. Indian classical raags are particular to times of day and to the seasons of the year. The artists attempt to portray a certain instant: the moment a bird takes flight at night; a king leaving for battle as his queen watches from her tower; the first rain….. They delve deeper and deeper into a single, at times very transient, emotion in order to reveal the truth at its core. In Avital’s opinion Joyce’s short poems did just that as well and therefore, despite being shot down by a closed-minded gatekeeper, she persevered. Twelve years (and five albums) later, with Joyce’s work now out of copyright, she is finally releasing this, her first recorded album.